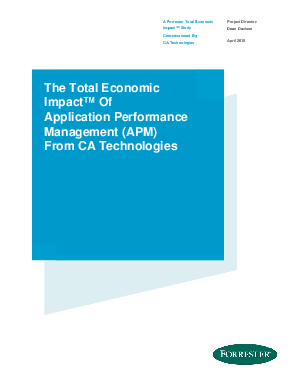 CA Technologies commissioned Forrester Consulting to conduct a Total Economic Impact™ (TEI) study and examine the potential return on investment (ROI) that enterprises may realise by deploying CA Application Performance Management (APM). The purpose of this study is to provide readers with a framework to evaluate the potential financial impact of CA APM on their organisations. Download this study to understand how CA APM allows organisations to pinpoint application performance problems to improve the quality of customer experience for businesses and consumers.